Monday November 1st 1897 I did a small washing this morning and churned soon after dinner. I ironed all the clothes in time to get supper. Will was working most of the day with the hogs. Tuesday November 2nd 1897 I did some extra work about the house in the forenoon and got a nice dinner. Jim who worked for us last summer was here for dinner. The boys went to vote and after they came back killed a big hog. weather cool. Pete went to town. 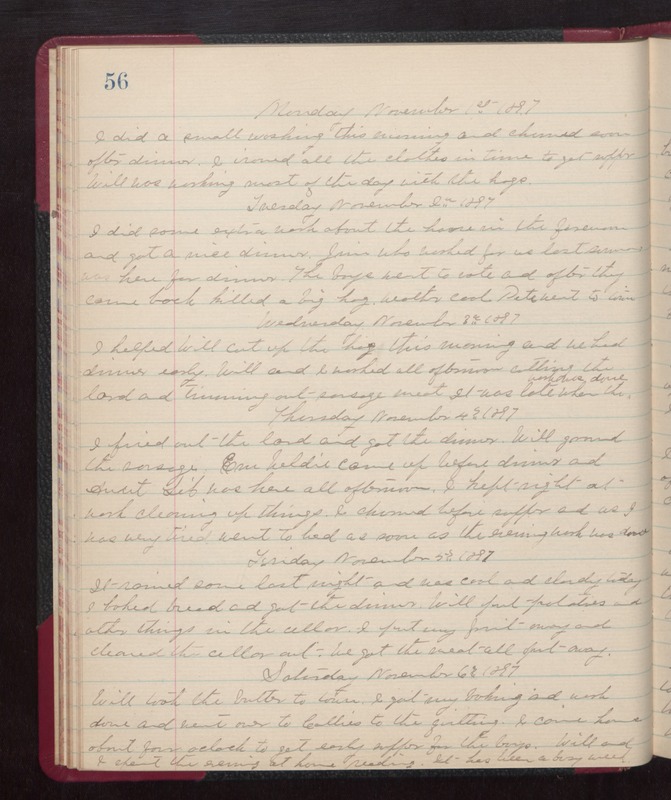 Wednesday November 3rd 1897 I helped Will cut up the hog this evening and we had dinner early. Will and I worked all afternoon cutting the lard and trimming out sausage meat. It was late when the work was done. Thursday November 4th 1897 I fried out the lard and got the dinner. Will ground the sausage. Em Weldie came up before dinner and Aunt Lib was here all afternoon. I kept right at work cleaning up things. I churned before supper and as I was very tired went to bed as soon as the evening work was done. Friday November 5th 1897 It rained some last night and was cool and cloudy today. I baked bread and got the dinner. Will put potatoes and other things in the cellar. I put my fruit away and cleaned the cellar out. We got the meat all put away. Saturday November 6th 1897 Will took the butter to town. I got my baking and work done and went over to Callies to the quilting. I come home about four oclock to get early supper for the boys. Will and I spent the evening at home reading. It has been a busy week.